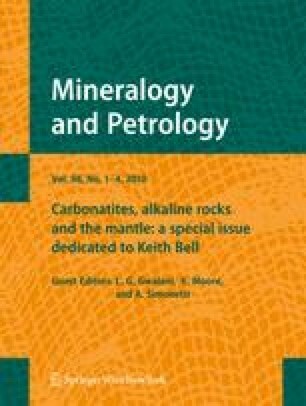 Protogranular spinel-peridotite mantle xenoliths and their host sodic alkaline lavas of Cretaceous to Paleogene age occur at the same latitude ≈26°S in central eastern Paraguay and Andes. Na- alkaline lavas from both regions display similar geochemical features, differing mainly by higher Rb content of the Paraguayan samples. Sr, Nd, and Pb isotope ratios are also similar with predominant trends from depleted to enriched mantle components. The mantle xenoliths are divided into two main suites, i.e. relatively low in potassium and incompatible elements, and high in potassium and incompatible elements. The suite high in potassium occurs only in Paraguay. Compositions of both suites range from lherzolite to dunite indicating variable “melt extraction”. Clinopyroxenes from the xenoliths display variable trace element enrichment/depletion patterns compared with the pattern of average primitive mantle. Enrichment in LREE and Sr coupled with depletion of Nb, Ti and Zr in xenoliths from both areas are attributed to asthenospheric metasomatic fluids affecting the lithospheric mantle. Metasomatism is apparent in the sieve textures and glassy drops in clinopyroxenes, by glassy patches with associated primary carbonates in Paraguayan xenoliths. Trace element geochemistry and thermobarometric data indicate lack of interaction between xenoliths and host lavas, due to their rapid ascent. Sr and Nd isotope signatures of the Andean and Paraguayan xenoliths and host volcanic rocks plot mainly into the field of depleted mantle and show some compositional overlap. The Andean samples indicate a generally slightly more depleted mantle lithosphere. Pb isotope signatures in xenoliths and host volcanic rocks indicate the existence of a radiogenic Pb source (high U/Pb component in the source) in both areas. In spite of the distinct tectonic settings, generally compressive in the Central Andes (but extensional in a back-arc environment), and extensional in Eastern Paraguay (rifting environment in an intercratonic area), lavas and host xenoliths from both regions are similar in terms of geochemical and isotopic characteristics. The Brazilian Agencies “Fundação de Amparo e Pesquisa do Estado de São Paulo”(FAPESP) and “Conslho Nacional de Pesquisa” (CNPq) financed the research carried out in Paraguay. The work in Andes was supported by the DeutscheForschungsgemeinschaft (DFG, German Research Foundation) within the Sonderforschungsbereich (SFB) 267, Deformation Processes in the Andes. The paper benefitted from the invaluable criticism of G. Rivalenti and R. Omarini. The authors acknowledge H. H. G. J. Ulbrich for revising the manuscript.